"Ghunghat" redirects here. For other uses, see Ghunghat (disambiguation). 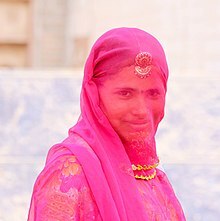 A ghoonghat (ghunghat, ghunghta, ghumta, odhni, laaj, chunari, jhund) is a veil or headscarf, originating from the Indian subcontinent, worn by some married Hindu, Jain and Sikh women to cover their head, and often their face. Generally aanchal or pallu, the loose end of a sari is pulled over the head and face to act as a ghunghat. A dupatta (long scarf) is also commonly used as a ghungat. Today, facial veiling by Hindu women as part of everyday attire is now mostly limited to the Hindi Belt region of India, particularly Rajasthan, Uttar Pradesh, Haryanaand Bihar. Facial veiling is not sanctioned in Hinduism, Jainism, Buddhism, and Sikhism but some sections of the society from the 1st century B.C. advocated the use of the veil for married women, which came to be known as ghoonghat. It has been both romanticized and criticized in religious and folk literature. The word ghoongat, ghunghat or ghunghta is derived from Avagunthana (Sanskrit: अवगुण्ठन) meaning veil, hiding and cloak and Oguntheti (Pali: ओगुन्थेति) to cover, veil over and hide. Woman in ghoonghat; Rajput miniature painting from Bundi, Rajasthan, India. The ghoongat, ghunghat or ghunghta veil evolved from ancient Avagunthana in (Sanskrit: अवगुण्ठन) veil, hiding and cloak. Early Sanskrit literature has a wide vocabulary of terms for the veils used by women, such as avagunthana meaning cloak-veil, uttariya meaning shoulder-veil, mukha-pata meaning face-veil, and sirovas-tra meaning head-veil. In the post-Gupta period, Śūdraka, the author of Mṛcchakatika set in the fifth century BC, mentions that some females of elite groups wore a thin head-veil (avagunthana) to conceal and beautify their coiffures. This hair-net of various colors was called as jālaka and it was used to support the hair so that they are not ruffled by the breeze. However, this female hair-dress was not used by women everyday and at every time. It was worn on special occasions like marriage or at the time of going out. He notes that a married lady was expected to put on a veil while moving in the public. This may indicate that it was not necessary for unmarried females to put on a veil. In Mṛcchakatika, courtesan Vasantasena's mother, having received ornaments for her daughter from a wealthy suitor to keep her as his mistress, she sends Vasantasena with her maid, asks her to go in the carriage bedecked with ornaments and to put on her avagunthana veil. This instruction is taken to signify that a courtesan who has accepted a suitor, had to use a veil in public similar to married women. At the end of the play when Vasanthasena is legally wedded, she receives the title "Vadhūśabda" meaning "title of a bride" simultaneously with the veil "vasantasenām avagunthya" meaning "a token of honorable marriage". In the same literature, courtesans' maid servant Madanika marries her lover Sarvilaka, a thief who changes his ways. Her new husband says to her that she has achieved what is difficult to acquire: "Vadhūśabda avagunthanam" meaning "the title and veil of a bride". In the Pratimānātaka, a play by Bhāsa (3 - 4 CE) describes in context of the Avagunthana cloak-veil that "ladies may be seen without any blame [for the parties concerned] in a religious session, in marriage festivities, during a calamity and in a forest". The same sentiment is more generically expressed in Nāgānanda and Priyadarśikā by Harsha, where maidens were expected to wear no veil; it was donned only after the marriage. Later, the veil was referred to by the same term, avagunthana, in Śiśupālavadha and the Dashakumaracharita. According to commentator Sankara, the ladies of Sthanvisvara used to go about covering their faces with a veil. Bride in ghoonghat during Muh Dikhai ceremony in Rajasthan, India. In Buddhist Mahayana literature, Lalitavistara Sūtra written in the 3rd century CE, young bride Yasodharā objected to observe veiling (oguntheti/oguṇthikā) in front of respected elders. This was taken to be a sign of immodesty and willfulness, as people criticized her and gossiped. When she became aware of this, Yasodharā came before the assembled court and defended herself in a long statement: "Those whose thoughts have no cover, no shame or decorum or any virtue, those who gossip, may cover themselves with a thousand garments, yet they walk the earth naked. But those who veil their minds, control their senses, and have no thought for any other except their husband, why should they veil their faces?" Yasodharā's parents-in-law were delighted with their daughter-in-law's proud statement and gave her two white garments covered with jewels. The Lalitavistara Sūtra reflects changing times around the 3rd century CE and Buddhists' attempt to counter this growing practice, as there is no mention of this entire incident in early Buddhist Theravada literature. In Valmiki's Ramayana dated between the 5th century BCE to the first century BCE, Prince Rama asks his wife Sita to unveil herself so that the gathered citizens of Ayodhya can take a look at them before they go in exile to the forest; there is no mention of Sita veiling herself again after this incident. At the end of the epic, hearing the news of Ravana's death, his queens giving up to lamentations rush outside without their Avagunthana, in which chief queen Mandodari surrounding his corpse says "Why do you not get angry, beholding me, having put off my veil, walk out on foot by the city gate? Do you behold your wives who have thrown off their veils. Why are you not angry seeing them all come out of the city?" Thus, it is notable that royal women avoided public gaze and veiling was expected to be worn only by married women. In Abhijñānaśākuntalam by Kālidāsa, written between the 3rd and 4th century CE, when the heroine arrives at King Duhsanta's palace, seeking to take up her wifely status, the king first remarks "Kā svid avagunthanavati" meaning "who is this veiled one?" and immediately forbears to look at her, with the words "Anirvarnaniyam parakalatram" meaning "The wife of another is not to be inspected." This largely indicates that Avagunthana was a sign of a respectable married woman, and was a married woman's raiment. In Kathāsaritsāgara written in the 11th century AD, heroine in the story Ratnaprabhā protesting: "I consider that the strict seclusion of women is a folly produced by jealousy. It is of no use whatsoever. Women of good character are guarded only by their own virtue and nothing else." Rational opposition against veiling and seclusion from spirited ladies resulted in the system not becoming popular for several centuries. However, it is notable that some section of society from the 1st century B.C. advocated the use of the veil for married women. There is no proof that a large section of society observed strict veiling until the medieval period. Under the Islamic Mughal Empire, various aspects of veiling and seclusion of women was adopted, such as the concept of Purdah and Zenana, partly as an additional protection for women. Purdah became common in the 15th and 16th century, as both Vidyāpati and Chaitanya mention it. Sikhism was highly critical of purdah; Guru Amar Das condemned it and rejected seclusion and veiling of women, which saw decline of purdah among most classes during this period. A Hindu bride with full veiling during Hindu wedding ceremony in Jaipur, Rajasthan, India. In ghoonghat practice, facial veiling observed by married women is known as Laaj (Sanskrit: लज्जा, Lajja - modesty, honor, shame). In veiling practice, it literally means "To keep (one's) modesty, shame and honor". Earliest attested word Laaj in context of veiling is found in Valmiki's Ramayana as lajjaavaguNThanaan describing Mandodari. However, it is unclear whether it refers to facial veiling. During a marriage ceremony, the bride wears a veil given by her parents. Later, during the ceremony the bride's mother-in-law covers her face with ghoonghat; she therefore simultaneously wears the veil given by her parents and that from her in-laws, symbolizing her passing from the protection of one's household to another. 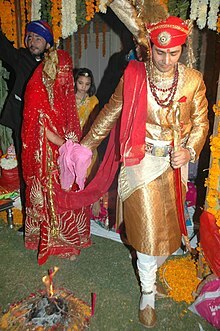 Muh Dikhai (Devanagari: मूह दिखाई, first gaze) is a post-wedding ceremony, where the bride is formally introduced to the groom's relatives and extended family. The ceremony takes place once the bride arrives in her new home; each family member lifts her veil, looks at the bride and gives her a welcoming gift. She receives Shagun from her mother-in-law, which is typically jewelry, clothing and silverware. After this ceremony the bride observes full veiling for the next few months or until her parents-in-law advise her to unveil. During the early 1900s, women of royal and aristocratic class were first to abandon strict veiling in public. However, the head was loosely veiled due to sensitivity towards the custom during changing times. The other classes soon followed; it lingered on in some parts of India until well after the 1940s. Facial veiling has gradually declined, and is mostly limited to parts of Hindi-speaking areas today. In ghungat, a woman will veil her face from all men to whom she's related by marriage and who are senior to her husband. This would include, for example, her husband's father, elder brother and uncles. The effect of ghungat is to limit a young woman's interaction with older men. In 2004, the India Human Development Survey (IHDS) found that 55% of women in India practice some form of ghoonghat, majority of them in Hindi-speaking states. The survey found that some women may cover their face fully but for others, partial covering of the face is more a nod to propriety than a large impediment. Bride in veiling during Muh Dikhai ceremony. Women in veil performing folk dance at wedding. Women performing folk dance in ghoonghat. ^ Rohini Chowdhury 2011 "Gautama Buddha: The Lord of Wisdom" chapter 1, page 9. ^ Guindi, Fadwa El (2003). Veil: modesty, privacy and resistance (Repr. ed.). Oxford [u.a. ]: Berg. pp. 109–111. ISBN 1859739296. ^ Nevile, Pran (2006). Lahore: a sentimental journey. New Delhi, India: Penguin Books. p. 77. ISBN 0143061976.